There's more than rainforests in Costa Rica. Over 200 volcanic formations have been identified in Costa Rica. Some of them date back over 65 million years, although several are quite young, formed within the last 2 million years. Most are dormant, but five are still considered active. Volcanic soil is rich in minerals and nutrients. This natural fertility and is one key reason Costa Rica harbors such lush landscapes, dense forest and vibrant rivers, towering mountains and spilling blue waterfalls. The combination captivates visitors and scientists and hosts a plethora of outdoor activities, including white water rafting, bungee jumping, fishing, kayaking, windsurfing, zip lines and exploration. Volcanoes also call hikers up their slopes to see crater lakes of astonishing color! Why so many volcanoes? Costa Rica is held within the Pacific Ring of Fire, a multi-national coastal area that holds 452 volcanoes, about 75% of the world total. The Ring of Fire's topography is the result of shifting tectonic plates and is associated with a series of ocean trenches, and also earthquakes. 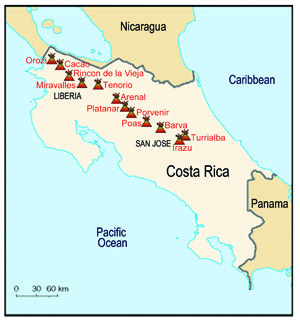 Most of Costa Rica's volcanoes are in the Central and North Central part of the country. Hike a volcano. Or just look at one. There are many volcanoes worth seeing while you are in Costa Rica. However, six are truly notable and have inspired namesake National Parks. They are top tourist attractions. Listed in order of summit elevation with links to detailed pages about these special travel destinations. Irazú is the tallest volcano in Costa Rica and, on a clear day, both Pacific and Atlantic Oceans can be seen from the summit. Turriabla is the second tallest volcano, active since 6300 BCE but no major eruptions since 1861. Poás is the most visited volcano because it is very accessible and close to San Jose, about 1.5 hours from the city central. Rincón de la Vieja is part of nine contiguous craters in the Guanacaste area and draws hikers to its challenging climb and relaxing hot springs. Tenorio, the least well-known volcano with a National Park named after it, has naturally heated swimming holes. Arenal is perhaps the best-known volcano in the entire country of Costa Rica, due to its near-constant flow of bubbling red lava and restorative thermal pools. See our full list of Costa Rica National Parks and consider all the exceptional activities that Costa Rica has to offer.